We spent over 50 hours over 7 days researching and testing more than 15 different types and brands of golf gloves and found that fit, variety of sizes, and materials used in manufacturing were the most important factors for consumers shopping for golf gloves. The MG Golf DynaGrip Golf Glove scored high marks in all categories and is our overall top pick. Only premium Cabretta leather skins are used to make these popular golf gloves. They are very durable and super soft and comfortable to wear. The tanning process that they go through during manufacturing enables the gloves to be resistant to perspiration and moisture. Even though some golfers believe that golf gloves are not necessary there are many professionals that swear by them and won’t play without them. If you are just starting out, it will benefit you greatly to use a high quality golf glove while you are learning and improving your skills. Once you play with one you will more than likely continue to use them. There are many different brands, colors, and styles of golf gloves on the market. Unless you know a lot about them, choosing the right one for your game can be overwhelming. We have provided a few tools that you can use to guide you through the process of choosing the right golf glove. We have taken the three top-rated golf gloves resulting from our extensive research and reviewed them in detail below so you can learn about their features and what makes them so popular with other golfers. These reviews will give you a chance to get more in depth information so you can see if one of these selections will fit your needs. We have also included a buying guide that will educate you on what features to look for when you are searching. This guide also lists the different types of golf gloves there are and the differences between them. The MG golf glove provides golfers with a fit that hugs your hand along with a super soft feel, durability, and style as well. All of the features that this glove offers make it one of the most popular golf gloves on the market. Even winners of PGA tour events have worn the MG Dynagrip golf glove. 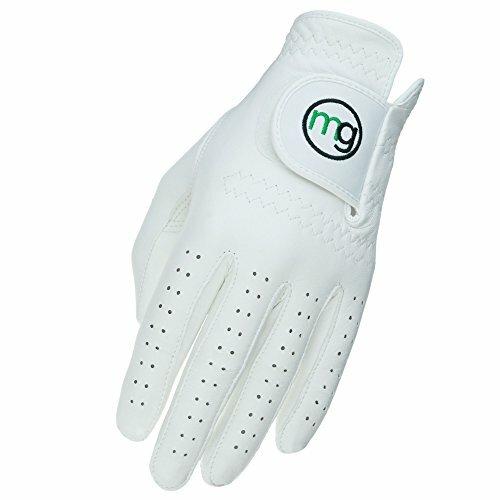 The MG golf glove is made from 100% Cabretta leather which is very durable and because of the tanning process used, resistant to perspiration and moisture. The quality of this glove and the tacky connection it provides between the club and your hands you will be able to use a lot less grip pressure that results in better shots. The edge trim of the MG golf glove is durable and very thin so the edge of the leather does not fray even after extensive use. The stitching provides a stylish appearance and provides plenty of extra strength where stress can make lesser quality gloves fall apart. 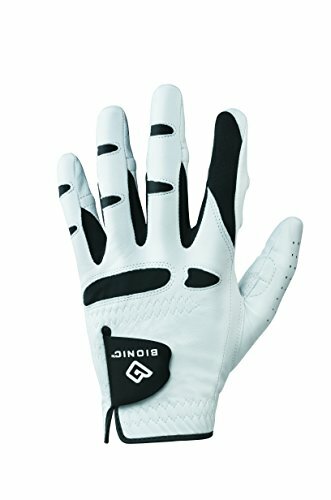 Bionic’s Stablegrip golf glove for men is made of genuine leather and features a pad on the palm for extended life of the glove as well as extra support. You will get the benefit of two times the strength in a spot that lesser gloves break down and fail. Another benefit to this pad is that is allows even grip on the club that is lighter so you can stay in control throughout the round. You won’t have to worry about loosening wrist straps and baggy fingers with the Stablegrip golf glove. The pre-rotated design of the fingers fit the natural curve of your hand so the glove fits snugly and like a second skin. There is Lycra between the gussets of the fingers and the top of the knuckles that offer plenty of flexibility and breathability even during humid, hot rounds. The interior features terry cloth in areas of the glove where moisture can be a problem so you don’t lose your grip on the glove. Another great feature of this golf glove is that it can be washed on the gentle cycle with a mild detergent. Air dry with cool air, flat, and do not use bleach when washing. Nike is a well-known name in the sports industry and that includes golf. 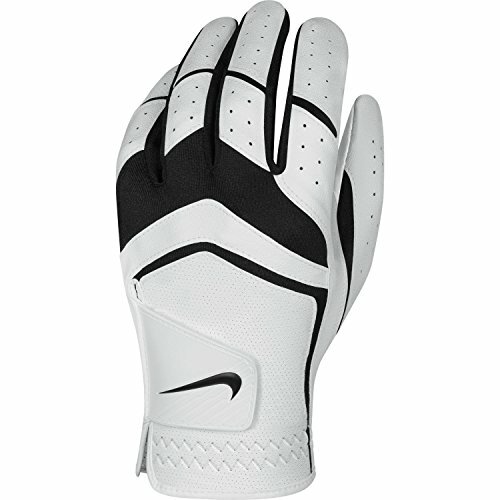 The Nike Dura Feel VIII is made from premium goatskin leather that is on the thumb and palm to provide a sturdy, secure grip that will last throughout the whole round of golf. There is stretch fabric in strategic locations on the glove that will give you plenty of flexibility and airflow where it is needed. The synthetic leather panel located on the back of the hand is perforated and provides more airflow so you hand will not get sweaty. The ergonomic fit enhances you game and allows players to feel comfortable during their game. There is a custom fitting system that works for all hand sizes and shapes so you get the glove that will fit your hand the best and provide the best performance possible. The three top-rated golf gloves we have reviewed above are all high quality gloves made from premium leather that focus on excellent fit and great performance. They are affordable, available in many sizes, and have features that will improve your golf game. Taking the time to be prepared for your golf game by choosing the right golf glove will enable you to have the kind of secure grip you want while staying comfortable. These gloves will prevent your hands from sweating and sliding around when you are trying to remain steady. Once you are ready to purchase a golf glove choosing one of the three top-rated selections is a great place to start. If none of the golf gloves we have featured above are what you’re looking for, we have added 7 more gloves for you to consider. Before you purchase a golf glove it is important to ensure that it is the right one for your needs. We have listed the considerations you should keep in mind when you are sorting through all of the different selections available. Proper Fit – When it comes to choosing the right golf gloves, size is very important. You want to choose a size that is not too small or it could tear when you wear it. On the other hand, a golf glove that is too big is not good either. If it wrinkles after you have worn it a few times, it is clearly too big. Wearing a glove that is too big will cause blisters on your hands. The majority of golf gloves are available in small, medium, large, and extra-large. Some gloves are available in what is known as cadet sizes that feature shorter fingers. It may be surprising to know that as much as 50% of golfers wear gloves that are too large for their hands. You want to choose a glove that feels like a second skin over your hand with no extra material at the end of the fingers or across the palm. When putting the glove on you will start with the fingers first and insert the thumb last. There is a difference between a snug fit that is like another skin and a glove that is too tight so make sure you know the difference. One way to check and make sure the glove is the right size is to ensure the Velcro fastener does not come across more than 75% of the hand. Left or Right Hand? – You only need a golf glove for one hand. This provides you with the ability to take complete control over your swing. If you are right-handed, choose a left-handed glove and if you are left-handed choose a right-handed glove. You can wear gloves on both hands but your shots will be a lot more powerful if you have one hand free. Material – You want the golf glove you choose to be durable and long lasting. You also want value for the money you spend so you will want to check the material that is used to make the golf glove you are considering. The majority of gloves on the market will be made with synthetic leather, genuine leather, mesh fabric or a combination of these materials. The more expensive gloves will have more leather and will last longer and the less expensive gloves will be made with more synthetic materials. Glove closures – The best golf gloves are easy to put on, wear, and take off. Look for gloves that feature a Velcro flap or strap. This feature allows you to adjust the fit of the glove to be looser or tighter. You will get the best fit from gloves that offer a flexible closure. Breathability – Making sure that your hand stays dry makes for a much better golfing experience. When you are looking for a good golf glove, look for one that is perforated on the fingers, thumb, and palm. This perforation allows for plenty of airflow so your hand stays drier. Some styles feature mesh fabric that increases airflow even more. Gloves that have the ability to wick moisture away are also a good idea. Construction quality – Make sure that the construction of the glove you choose is high quality. Look for durable stitching, reputable manufacturers, and warranties or guarantees that stand behind the glove you choose. When a glove has been created with strong stitching and reinforcements at the critical points of the glove you will be able to have a golf glove that will last for a long time, especially if you take the time to care for it properly. Color – Depending on the manufacturer you can find golf gloves in a variety of colors. The most common colors are white and black but you can choose solid colors like red, yellow, blue, and green as well. Not all manufacturers offer color choices but if color is important to you, you will be able to find a few choices if you look around. There are several types of golf gloves on the market. We have listed the common types below along with information about each type. Leather – The most common material used for golf gloves is leather. Leather provides golfers with many benefits including excellent resistance to moisture, great feel, superior grip and it will stay soft for a long time even after extensive use if it is cared for properly. Something to remember about leather is that it will stretch over time so choose one that fits properly. If your glove does get wet, it will go back to the same grip before if you dry it properly. Let your glove dry naturally after pulling it into the right shape. Synthetic – Synthetic materials are usually used on the smaller parts of the glove, namely over the knuckles to provide more flexibility in your finger joints. Synthetic materials are very lightweight and stretchy. Some golf gloves will use 100% synthetic materials which make them more durable than leather. They are also good for keeping your hand cool when you are playing in warmer weather. All-Weather – This type of golf glove is for golfers who regularly play in super humid or wet conditions. They are much more resistant to water than any of the other materials and offer much better feel in damp conditions. This lightweight material offers breathability and a grip that improves as the glove gets wet since the fibers that are on the palm stand up as they get wet and provide more friction. This type of golf glove is usually covered in material that is thicker and warmer so your hand stays warm during cold weather playing. If you golf often in the rain or your hands sweat a lot the all-weather golf glove is a great choice. Thermal – If you love to golf even in the wintertime, thermal golf gloves are an excellent option for you. Thermal golf gloves have a knitted or thermal material that is thick and will keep your hand warm even in cold weather. You can wear thermal golf gloves on both hands if you choose. This type of golf glove is usually dark in color and looks like a regular winter glove. They keep the heat in your hands so you can play normally and not be affected by the cold temperatures. Golf Mitts – A golf mitt is not designed to be played in. They slip over your hands or a regular golf glove and are perfect for keeping the heat and feeling in your hands between shots. Choosing the right golf glove has a lot of benefits to you as a golfer regardless of your skill level and the amount of time you have been playing. The purpose of a golf glove is improve grip, feel, and the power of your shots. There are many different styles and types of golf gloves on the market. If you are an avid golfer that loves to play all year long, you may want to seriously consider getting a couple of golf gloves; one for summer and warm weather play and one for wintertime. With so many choices on the market it is very important to do your due diligence and learn the differences between the golf gloves available and how to sort through them. Remember the first step in choosing the right golf glove is to access your needs and preferences and figure out exactly what you are looking for in a golf glove. Keep in mind your skill level, the seasons you like to play, whether your hands sweat a lot, and a few other factors that will help you get a good idea of what you are looking for. Once you have this down, take a look at the three top-rated golf gloves we have reviewed above and see how they match up to your golf glove needs. If you have determined that none of the three top-rated selections will work, use the information in the buyer’s guide to sort through the different brands and styles. Once you have the right information, like what we have provided for you in the buying guide, you will be able to easily eliminate the styles and brands that don’t meet your needs and narrow down the field. You will be able to make a confident decision on the right golf glove for you without worry that it will not work well or fit well. You will find that the right golf glove will improve your swing and shots and improve your overall game.